The Drawing Board gives writers essential input from a full spectrum of artists at no cost. This fun and safe laboratory space allows writers to bring in work at various stages of development and move forward to staged readings and full productions. 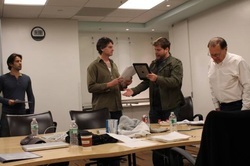 Every 4th Monday we present a table reading of a new script. We meet in a conference room at an office in midtown. The Drawing Board offers: Table Readings, Workshops, and Staged Readings.